Industry comment There's a secret many people in the IPTV/VoD industry don't want you to know. Setting up an IPTV network is actually incredibly easy. In fact, almost anyone can do it. But if you knew that, you'd build your own and no one would make any money by selling you proprietary products with huge mark-ups. 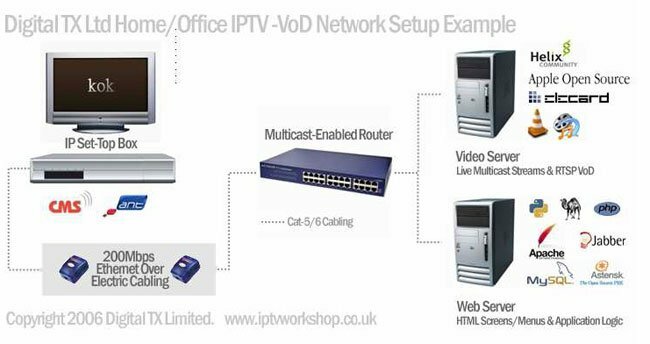 IPTV networks are basically intranets, only the web browser isn't on a PC, it is on a set-top box. If you've set up an intranet or public website, you can set up your own IPTV network and do what you want with it. You don't need massive and expensive servers, specialised set-top boxes or overly large development teams working with complex software. With the right hardware and software, it should take you less than a few hours. But why would you want to build your own? Doesn't look too difficult does it? Let's get started. In this guide, we're going to be cheap and cheerful, using free open source software (FOSS) where we can. We'll also be adhering to open standards wherever possible. Our HTML screens and menus will be housed on an Apache web server running PHP, Perl, Python and MySQL, and our video will be encoded in MPEG-4 H.264 AVC, packaged in a simple MPEG-2 transport stream. We’ll stream out our video with VLC and Helix Server. Naturally you can exchange any of those for something else that does the same thing, for example, WM9/IIS/.Net/SQL Server instead of MPEG-4/Apache/PHP/MySQL.